See http://wp.me/pJQyX-1U on the previous post on this species. When I first realized this common local tree, known as ‘taipoca branca’, belongs to the family Bignoniaceae, I had to wait almost a year before being able to observe it in flower for the first time. I had seen its typical bignon fruit for quite a while, but never its flowers. As it turns out, the flowers open early in the morning and last only a few hours, while my botanizing walks take place early in the afternoon, when the sun goes comfortable and skin damage is not a concern, between 2-3 pm in the winter time (March to October) and after 3 pm in the summer. Then one late December day in 2009 when taking a rare early morning walk I spotted some flowers at anthesis on lower branches of one of the trees held in observation. I took some pictures of them, collected several specimens for pressing and eventual deposit at the Herbarium of the State University at Feira de Santana (HUEFS), Bahia, Brazil, where all my collections are to be found. A quick check of my few reference books led me to believe I was dealing with Tabebuia cassinoides. I contacted a Brazilian bignon specialist, asking her to confirm my determination, and received a short reply that it was ‘likely’ the case (A lesson learned: never make ID suggestions when dealing with specialists, allowing them for quick and non-committal replies). From that time on I was thinking of this bignon tree as Tabebuia cassinoides. Until the moment I posted on Flickr a series of its images (http://bit.ly/nZC36l), representing the prominent features, and some botanists in São Paulo, having examined them, decided it couldn’t be T. cassinoides but rather T. obtusifolia, or T. stenocalyx. A mutual friend on facebook wrote to me to apprise of their findings, and eventually an email exchange with the bignon specialist studying this particular tribe led to the updated determination as Tabebuia stenocalyx Sprague & Stapf. 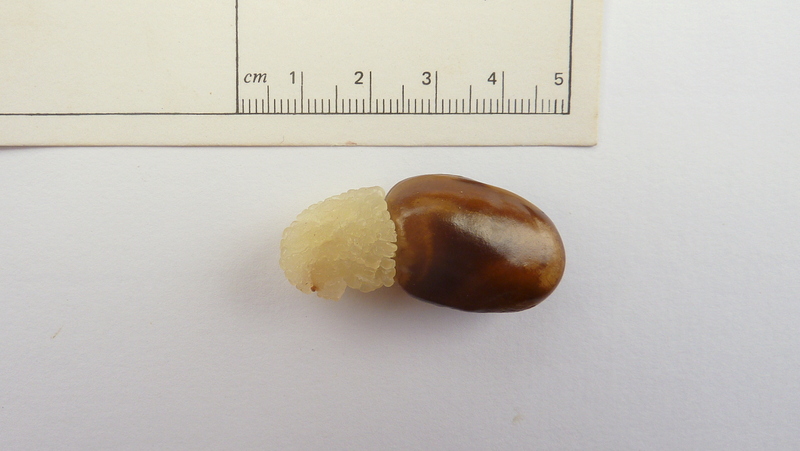 When I then checked for any determination updates on my collections at the HUEFS, available through the SpeciesLink (http://wp.me/pJQyX-1U), I discovered that it had been recently determined as T. stenocalyx by a visiting bignon specialist. My own failure to check one important reference source published in the Flora Neotropica monographs in 1992 as volume 25(2), when the digital versions of it became available, is inexcusable. When I finally got to see the species description in Gentry’s Bignoniaceae—Part II (Tribe Tecomeae), I realized the extent of my negligence: I could have done this taxonomic determination work by myself, using this wonderful source. I have been using Gentry’s Field Guide to the Families and Genera of Woody Plants of Northwest South America (Colombia, Ecuador, Peru) all along as my first aid when trying to identify sterile material, plants not in flower, or fruit. 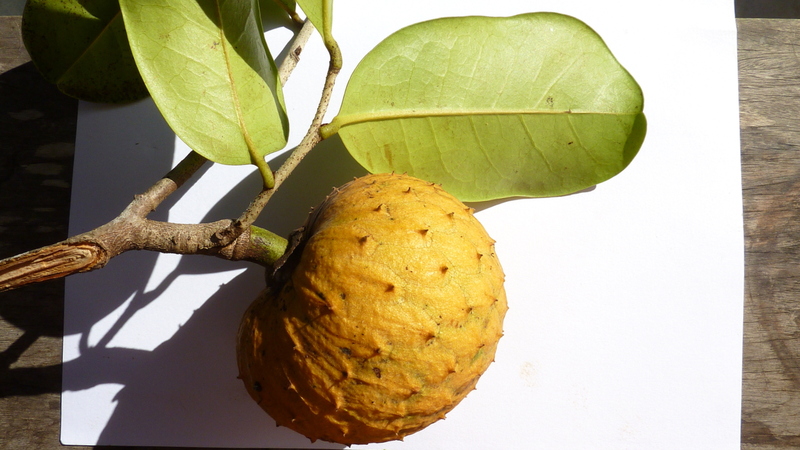 Annona salzmannii, known locally as araticum, is a medium-size tree of 10-15 m, quite common in this area, and one of the most common Annonaceae spp. around here with edible fruit. 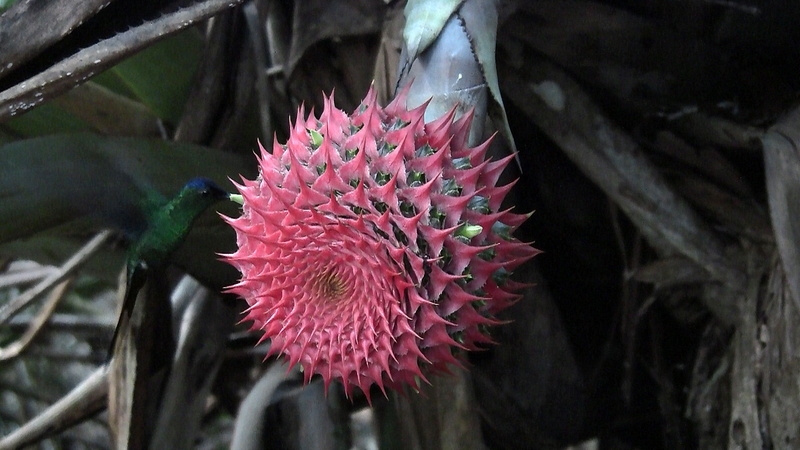 Its fruit bearing is not regular, with mass fruiting occurring every two to three years. 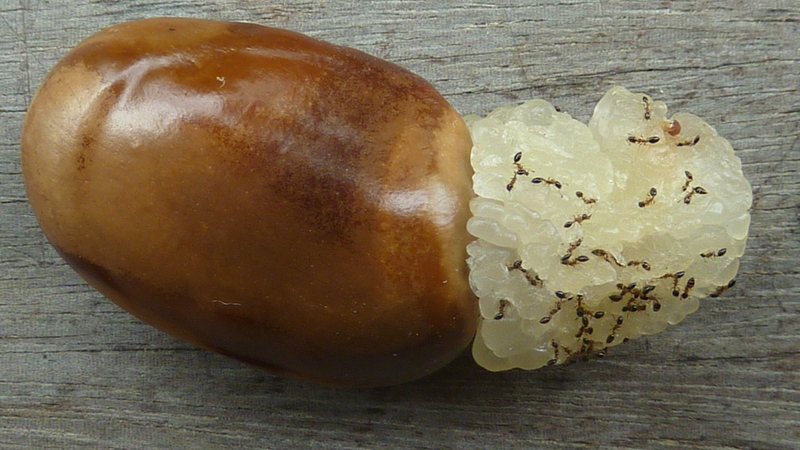 At other times the fruit is scant and usually spoiled by fruit-fly infestation. Local people think it bears fruit every five years or so when the trees produce female flowers. Their observations are true as far as periodicity of mass fruit bearing is concerned, whereas their explanation of the phenomenon is fantastical: the flowers of the sp. are perfect, with male and female parts always present. 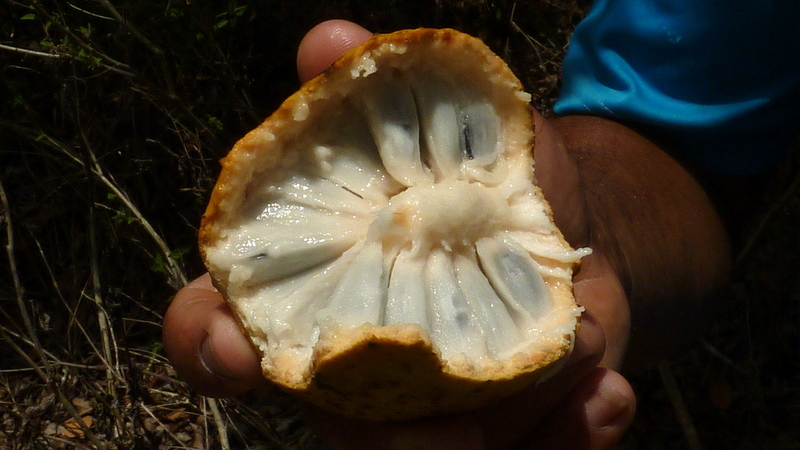 The fruit is good to eat for desert: its fleshy parts resemble in taste those of sugar apple (Annona squamosa L., ‘pinha’, in Brazilian Portuguese), or atemoya (Annona cherimola x squamosa). The biggest drawback are fairly large seeds that are too numerous for easy eating. It looks like this may be a bumper crop year, with many yellow fruit easily visible in the green foliage of this handsome looking tree. My set of images of the tree, its flowers, and fruit, is also available on Flickr (http://bit.ly/dFVTBX). No sooner discovered my first local mycoheterotroph Voyria tenella Hook, of Gentianaceae (http://bit.ly/atxXaX), on one of my short motorbike trips to the nearby patch of virgin Atlantic forest, accompanied (actually driven) by my house help (turned fellow plant and animal collector) Louro, as another mycoheterotroph, this time from Burmanniaceae, was spotted when looking for a good-size infructescence of what I eventually (and provisionally) was able to determine to be Orthomene schomburgkii (Miers) Barneby & Krukoff, of Menispermaceae (http://bit.ly/9Cbfjv). 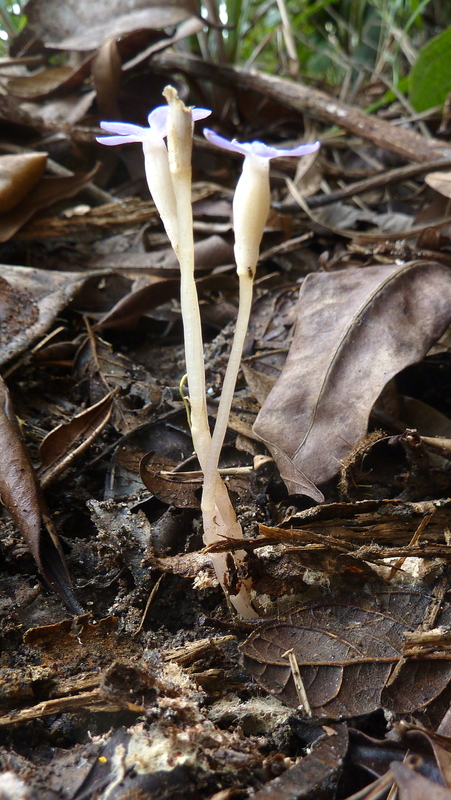 Its pale looking chlorophyll-less inflorescences were barely noticeable in the midst of the layer of decaying leaves in the dark of the understory vegetation. We collected some specimens of it and, upon photographing, put them in the 70% alcohol solution for deposit into my plant collection at the HUEFS (Herbarium of the State University at Feira de Santana, Bahia, Brazil). 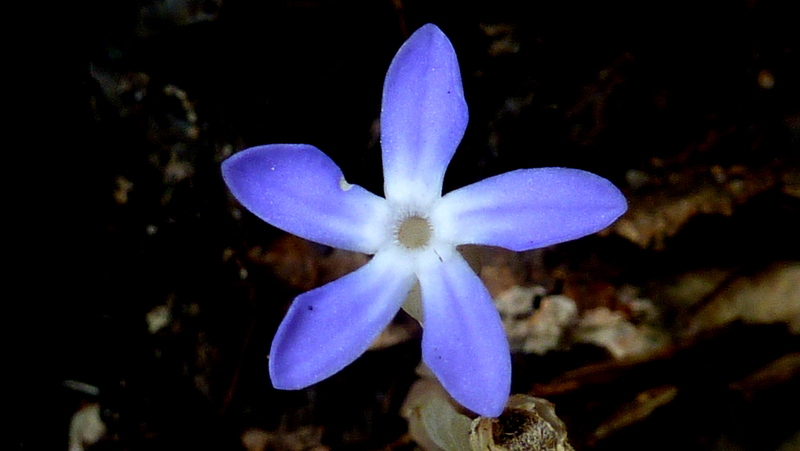 At home I was unable to come up with the family and genus ID, using my available resources (mostly those of the Internet), apart from realizing that like Voyria tenella it was a mycoheterotroph. I then sent some of its images to Daniel Nickrent, a well-known specialist in parasitic plants at Southern Illinois University in Carbondale who had previously identified my Voyria species. 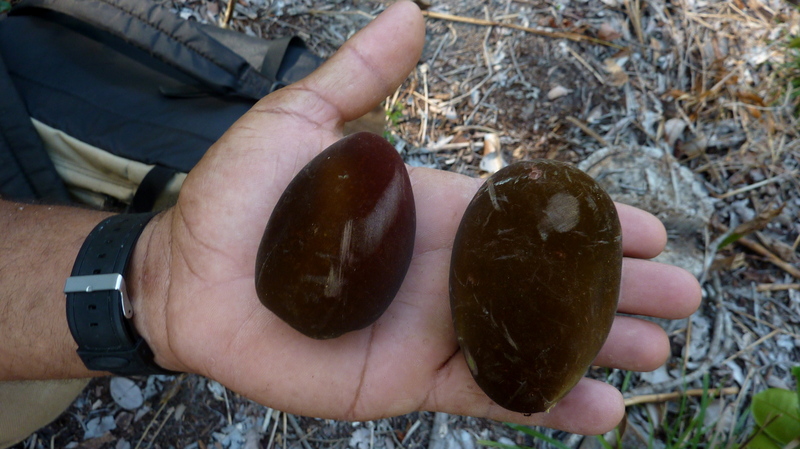 In a couple of hours I had his feedback: Gymnosiphon species, of Burmanniaceae, a new family record in my study of the local flora. 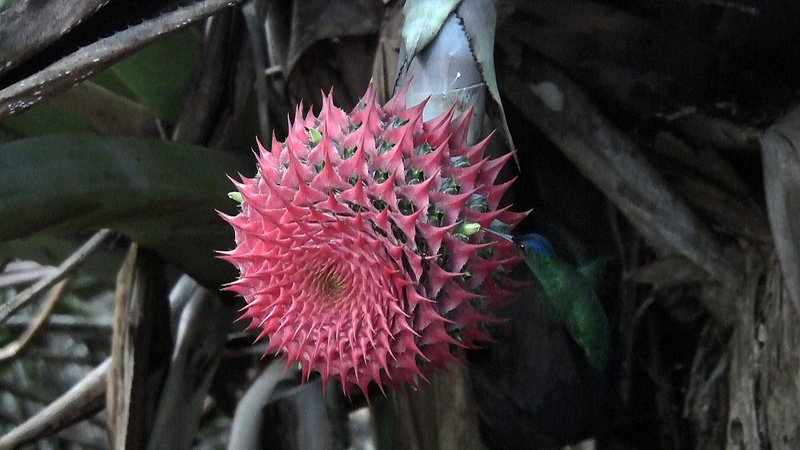 An online search for its distribution records for Bahia, Brazil, using SpeciesLink (a database of several Brazilian herbaria holdings, http://bit.ly/agXYU8), narrowed down the species search to Gymnosiphon divaricatus (Benth.) Benth. & Hook. f., as the only species recorded for my area. Some additional research of the available images and a perusal of the Flora Neotropica monograph of the family by Paul Maas and collaborators (vol. 42, Burmanniaceae, 1986) confirmed the species ID. 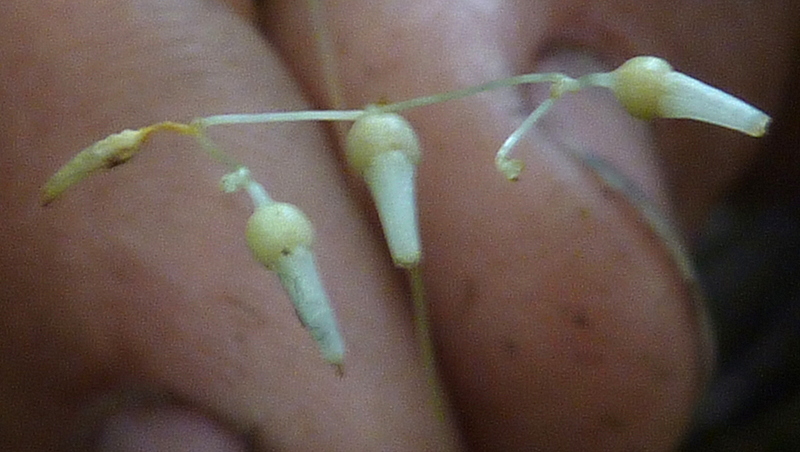 The Latin ‘divaricatus’ means ‘straggly, spreading’, evidently in reference to the bifurcate form of this plant’s inflorescence and the general ‘straggly’ appearance. According to Maas, the flowers are scented. I haven’t felt any noticeable scent. 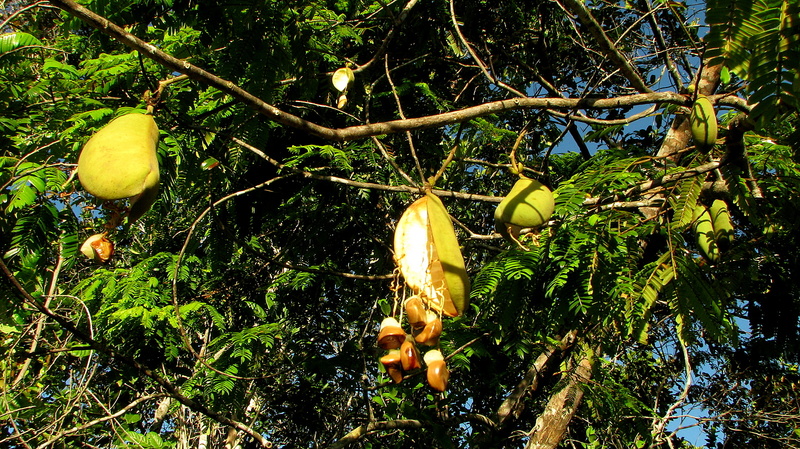 The species is distributed in forests of Central and South America. Additional images are on my Flickr pages (http://bit.ly/cTZvSL). Specimens of mycotrophs need to be preserved in 70% alcohol. Luckily, we were prepared for such an eventuality. See http://www.parasiticplants.siu.edu/Mycotrophs/Mycotrophs.html and http://www.newphytologist.com/view/0/virtspecissueMyco.html for further information. 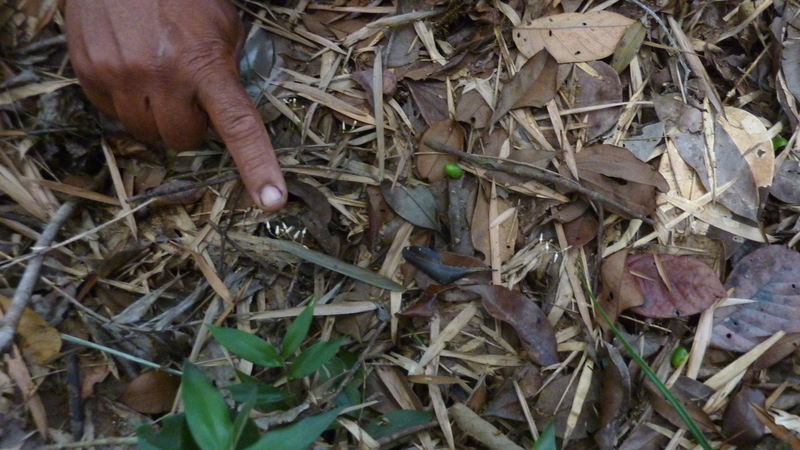 Symbiotic seed germination is widespread in orchids. PS. Thanks go to Dan Nickrent for the identification of the genus and Paul Maas for pinpointing the species. Paul Maas is the author of a monograph on Voyria (Maas, P. J. M. & P. Ruyters. 1986. 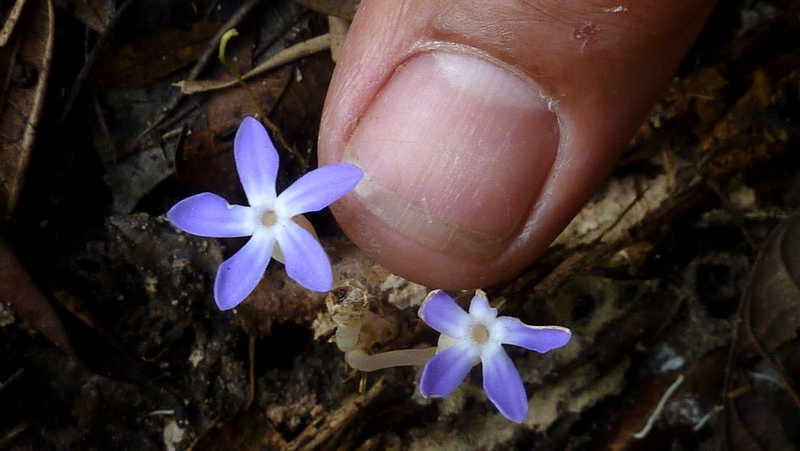 Voyria and Voyriella (saprophytic Gentianaceae). Flora Neotropica Monograph 41. The New York Botanical Garden, Bronx, NY). 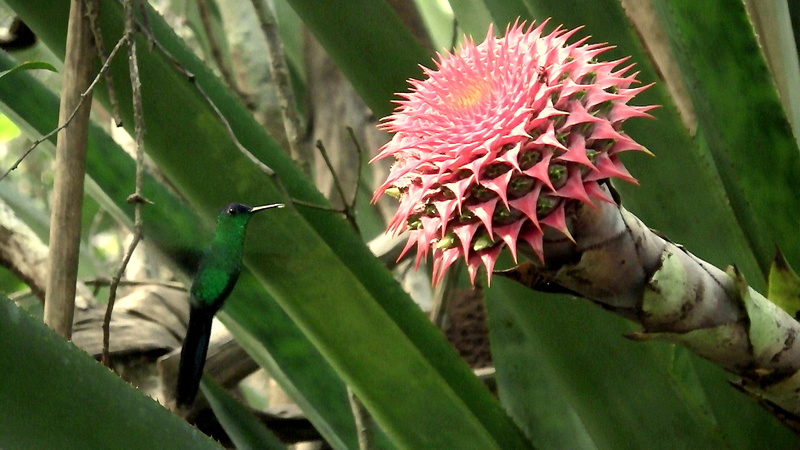 I have been wondering for a long time about this common local bromeliad’s pollinators. 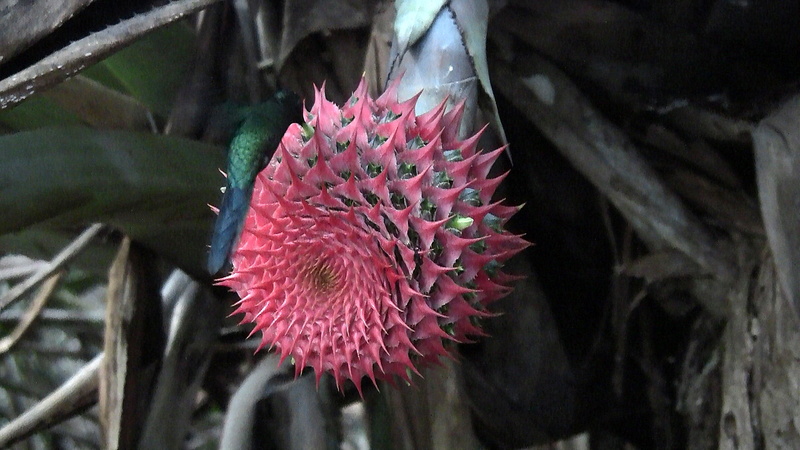 The plant itself is one of the biggest bromeliads around, growing as an epiphite fairly low to the ground, or on the ground itself, often forming communities in the scrub forest bioma. 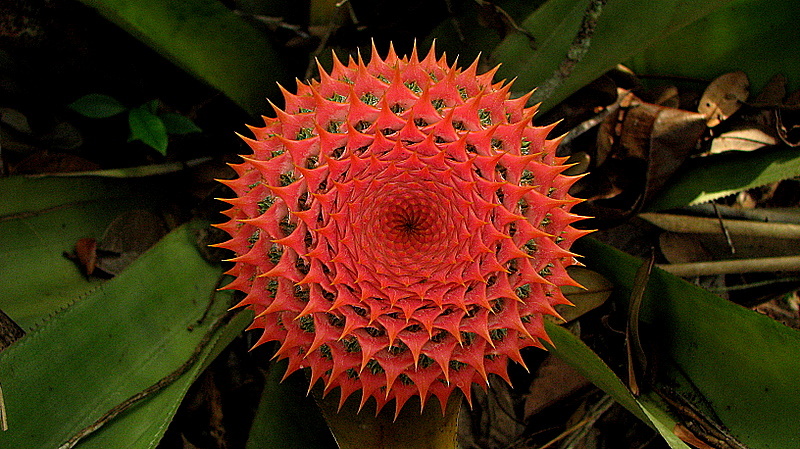 The inflorescence, especially early in its formation, is a sight to behold: its Fibonacci numbered saturated-red head is striking in the otherwise green setting. Yesterday’s walk brought an answer as to the identity of its pollinator: Violet-capped Woodnymph (Thalurania glaucopis) was there making frequent furtive visits while I stayed some 6 ft away observing and recording its movements using a camcorder, with mosquitoes relentlessly attacking the bare body parts of yours truly. On my follow-up visit the humming bird tried to steer away the intruder, flitting above my head and making angry calls, while still managing to visit three developing flowers. It’s that time of the year again when every morning I find several arillate seeds of Swartzia polita on the floor of my house, dropped by bats having free access to it at night, and thus no doubt about the dispersal method for this species may arise. 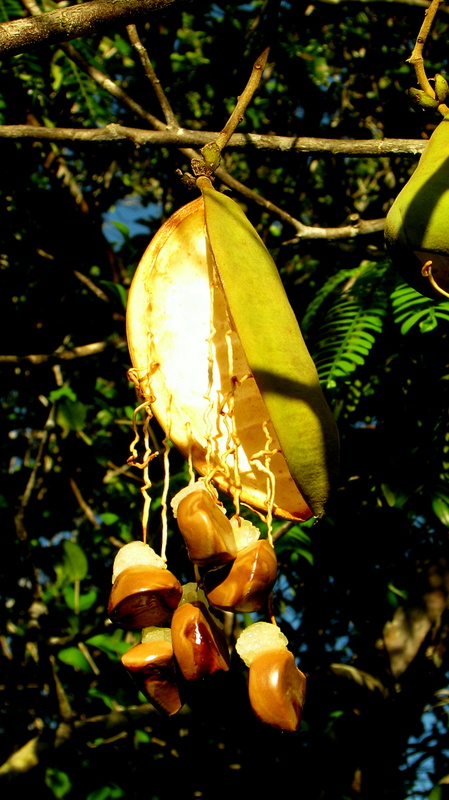 When the ripe fruit opens, its arrilate seeds hang on still attached to the seed box, in full display for picking by the nocturnal bats going after its nutritious arils (see the same bats, caught mating http://www.youtube.com/watch?v=YUJ258rOSu8). More of my images of the species are on Flickr (http://www.flickr.com/photos/plants_of_russian_in_brazil/2993438004/in/set-72157594574369082/). My earlier images of its flowers and fruit have been used in Healthful Herbs (Thunder Bay Press, 2008), a reworking of Jethro Kloss’ classic Back to Eden. A set of my images of the species is available on Flickr (http://www.flickr.com/photos/plants_of_russian_in_brazil/sets/72157623604759020/).